The black homicide rate is about 10 times higher than the white rate. It has been this way for quite some time (i.e., even as the rates have changed the differences themselves have remained fairly stable). it is a good bellwether for broader differences in social conditions. it demonstrates the limited power of mechanistic economic explanations and that even large residuals associated with race/ethnicity are not necessarily the product of “racism” on the part of police, teachers, etc. Despite these facts, the discussion of race and crime is n-tired in an unproductive mix of controversy and silence. At the same time that articles on age and gender abound, criminologists are loath to speak openly on race and crime for fear of being misunderstood or labeled racist. This situation is not unique, for until recently scholars of urban poverty also consciously avoided discussion of race and social dislocations in the inner city lest theybe accused of blaming the victim (see W. J. Wilson 1987). And when the topic is broached, criminologists have reduced the race-crime debate to simplistic arguments about culture versus social structure. On the one side, structuralists argue for the primacy of “relative deprivation” to understand black crime (e.g., Blau and Blau 1982), even though the evidence on social class and crime is weak at best. On the other side, cultural theorists tend to focus on an indigenous culture of violence in black ghettos (e. g., Wolfgang and Ferracuti 1967), even though the evidence there is weak too. Still others engage in subterfuge, denying race-related differentials in violence and focusing instead on police bias and the alleged invalidity of official crime statistics (e.g., Stark 1990). This in spite of evidence not only from death records but also from survey reports showing that blacks are disproportionately victimized by and involved in, criminal violence (Hindelang 1976,1978). Hence, much like the silence on race and inner-city social dislocations engendered by the vociferous attacks on the Moynihan Report in the 1960’s, criminologists have, with few exceptions (e.g., Hawkins 1986; Hindelang 1978; Katz 1988), abdicated serious scholarly debate on race and crime. Given the intense focus recently on “concentrated poverty” and segregation I decided to take a more in-depth look at this data for myself. I downloaded the CDC mortality data by county (2004-2013) and cross-referenced that with the Census ACS data by county (2010). I analyzed the data collectively (assessing the impact of % of each racial group and other covariates on the overall homicide rate within a county) and separately, disaggregated by race/ethnicity (assessing the determinants of each groups’ homicide rate with their own ACS county-level estimates). Although analyzing data at a county level isn’t as good as more granular levels of analysis in some respects, the way I see it is that even if each group is heavily segregated the controls should allow us to do a pretty good job of estimating these effects (especially when comparing each groups’ homicide rate to their own poverty rates and the like)..
Race is a strong predictor of homicide rates at a county level. It predicts better than the poverty rate, median household income, racial segregation, income segregation, education rates, and so on and so forth. The single-motherhood rate is a close second though. In the linear multi-regression models below I scaled all variables in standard deviation (SD) units to make it easier to compare their relative magnitude. As you can see in model (1) a one standard deviation increase in percent black corresponds to a bit more than a one standard deviation increase in the county homicide rate. Controlling for the poverty rate, single-motherhood rate, and racial segregation rate, as we see in model (4), reduces the association with black to about 0.6 SD. Curiously a 1 SD increase in the Theil racial segregation index is associated with a ~0.18 SD increase in the homicide rate, which is non-trivial, though perhaps less than some might expect. I am not convinced that segregation itself actually causes increased violence because it’s likely that increased violence and crime actually spurs further racial segregation, i.e., the arrow of causation likely runs substantially in the other direction (though I wouldn’t necessarily deny the potential for co-causality/feedback loops here). You might also note this (standardized) coefficient is roughly of the same scale as the coefficients for single-motherhood and poverty segregation. It’s also appreciably less than the association with poverty. Even in modestly racially segregated counties percent black remains a very strong predictor of homicide rates. Below are the regression results with and without controls keeping the dependent variable and race/ethnicity unscaled to make comparison across groups easier. In model 1 transitioning from a 100% white to 100% black county increases the expected homicide rate by ~28 homicides per 100,000 people per year whereas the change in the expected outcome is “only” ~18.5 in model 2 with extensive controls (keep in mind that the average homicide rate in N/W Europe is 1.0-1.5 per 100,000). This implies that controlling for an extensive set of covariates (in a linear model) only reduces the expected homicide rate differential by ~35%. Race remains an exceptionally strong predictor and this cannot be explained plausibly by racism/bias in reporting, prosecution, etc because this measure (which is derived from coroner reports) removes that sort of thing from the equation entirely. Poverty rates seem to be a strong predictor and was traditionally, in popular imagination, the go-to explanation for crime rate differences, so let’s take a brief look at that. Although it’s clear that poverty predicts homicide quite independently of black, it’s also clear that black predicts independently of the poverty. Moreover, if you look closely at the distribution and other analysis I present here it’ll be clear that poverty doesn’t come close to closing these racial differences. Single-motherhood is also a strong predictor. Based on the other evidence I have seen, I have come to view the single-motherhood being at least a very strong proxy for community health is and, in many respects, a stronger predictor of inter-racial differences than other measures like poverty rates. It does not entirely explain the observed racial differences here, but it mediates much of the relationship and does so more effectively than other common measures. 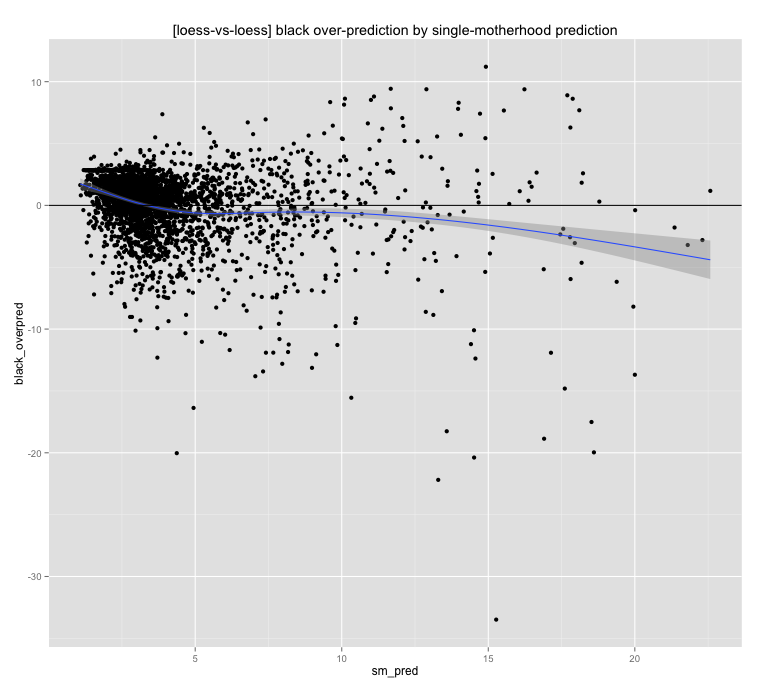 Controlling for single-motherhood rates with an unweighted loess regression I find little evidence to suggest that percent black adds much in the way of predictive validity. Whereas if I invert this, I do indeed find that single-motherhood rates have some incremental power over and above percent black. Obviously these two measures are well correlated, so it might be helpful to see counties with unexpectedly high or low rates of single-motherhood given their black population share…. Counties with higher than expected rates of single-motherhood given their black population (negative on x-axis) have much higher than expected homicide rates given their black population (negative on y-axis). I find a modest association in counties with higher than expected black populations based on their single-motherhood rates, but it’s much weaker than the above relationship. Likewise, single-motherhood has incremental power, even accounting for poverty rates. whereas the same is much less true in the reverse. Like I did above with percent black and single-motherhood rates, if I look at the homicide residuals (over-predictions) on single-motherhood and poverty rates by deviations from expected poverty rates (as a function of single-motherhood) or single-motherhood rates (as a function of poverty rates), I generally find single-motherhood to be much more influential. Counties with much higher than expected rates of single-motherhood (negative on x-axis) given the poverty rate, have much higher than expected homicide rates (negative on y-axis). Of course black(er) counties systematically deviate along these lines. At any given income level, black communities tend towards substantially higher average rates of single-motherhood (which, incidentally, contributes significantly differences in poverty rates as this data is reported). Obviously this analysis is not exhaustive, but it certainly tends to support my view that single-motherhood is a strong predictor and that it not well explained by percent black or poverty rates. Besides the analysis above whereby I rely on multiple regressions to estimate the racial associations and the like from the aggregated data (all racial groups combined into single statistics), I also downloaded and analyzed racially disaggregated data for homicide rates and census demographic statistics (note: I exclude asians and pacific islanders from this part of the analysis because census and CDC aggregate this data differently and I didn’t feel like attempt to re-weight the census data to re-constitute their hybrid asian/pacific islander group). By now I think it should be pretty clear that the economic conditions of each group are not particularly strong predictors of their victimization rates and that they certainly don’t come close to closing the white-black gap. Even poor “white” counties have homicide rates quite a bit lower than affluent “black” counties with low poverty rates. (Note: Obviously the employment statistics fluctuates with time and large demographic shifts, but I’d bet there is a pretty good correlation across time or, at least, over the span of 5-10 years, i.e., communities with elevated unemployment in good times will usually be even more elevated in bad times, thus preserving the ordinal relationships reasonably well). Most of these measures are usually at least fairly well correlated so combining them won’t do much to close these differences either, but for the sake of skeptics…. One could play around with this forever, but I very much doubt that anyone can find a realistic economic-driven model that explains this. I do not dispute that there may be important ecological differences in these communities or that these differences might have some non-trivial influence, but the homicide differences are too vast to be explained by objective differences in the economic characteristics of the communities. Even with the composites above, some of which are influenced substantially by behavioral differences, which are not purely economic, and which are sensitive to things like crime rates (e.g., more crime tends to drive down housing and rental prices, encourage more “white flight”, etc), do not come close to closing these large gaps. 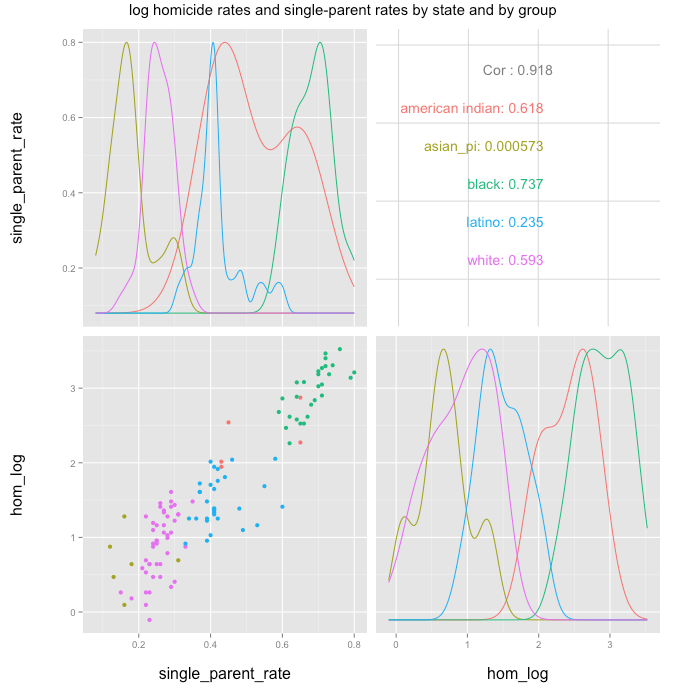 Although the single-motherhood rate is a strong predictor with the racially-aggregated (combined) data, the picture is more complicated when trying to predict homicides for each group in the disaggregated data. This plausibly explains a good deal of within and across group variation. The same cannot be said if I apply this same technique to other measures. It systematically overshoots the white and latino rates even when there is plenty of density and undershoots the black rate. …. you get the point. One way to try to answer this question is with a mixed effects model (specifically with the lme4 package in R). By allowing for fixed racial effects (as in, each group has its own intercept) and, later, in some models, random effects (varying slopes for each racial group), I can try to better estimate how much these covariates explain homicide rates within and across groups. First, I’ll compare several population-weighted models with fixed effects. You might note that in model (2) introducing poverty rates into the mix does little to change the homicide rate differences (compare to the racial coefficients in model 1) whereas in model (3) the white-black delta is about half the size. Likewise, in model (4), where I control for both poverty and family formation, the gaps actually increase slightly relative to model (3) and that the standardized single-motherhood coefficient is still about twice as large as the standardized poverty rate coefficient (keep in mind that the racial differences in single-motherhood are much larger than the economic differences). The single-motherhood rate is still very much significant, likewise for differences in the racial coefficients. I feel this is important to show because there appears to be fairly strong association between the county-wide racial segregation index and homicide rates for blacks, in particular, in simple bivariate regressions. Though you might also note that even in perfectly racially integrated counties (according to the index) the black homicide rate is still much higher than average and that most blacks are not in these heavily segregated counties. Likewise, direct measures of “concentrated poverty”, i.e., poverty segregation vs racial segregation, seem to show an even weaker relationship. Now if I go a step further and introduce random effects into these mixed effect models whereby groups are allowed to respond differently to these covariates (which may or may not make sense)…. As in the purely fixed effects model, single-motherhood does much to explain the black-white gap (albeit largely through the black rate), largely mediates the association with poverty (see model 3), and poverty segregation (as in model 4) does little to explain this either. Ideally I’d measure the poverty segregation levels of each group separately (don’t have that data yet), though I largely capture this with the family poverty rate (measured at a group level). I wouldn’t take these random effect models too seriously except to the extent that it further support the position that these “effects” aren’t likely to be explained by different baseline levels of single-motherhood and the like between groups(i.e., i’d produce similar estimates if I were to run regressions on the black community independently) and that these black difference are generally poorly explained by economic measures like poverty. At any given income level the rate of single-motherhood is much higher in the black community. This is clearly not just a phenomenon having to do with income levels. Also this whole “concentrated poverty” notion cuts both ways. Because affluent blacks are more likely to live near poverty, poor blacks are necessarily (somewhat) more likely to live near modally affluent (~middle class) peers. And more college educated adults. My point here is that the proponents of this view tend to overstate the economic (and sometimes educational) aspects of this and seem to want to have it both ways. Nor do blacks have a monopoly on “concentrated poverty”. Even at the hyper-local census-tract level we don’t find this. While blacks are more likely to live in “high-poverty neighborhoods” (>= 40% poor at census-tract level), only about 10% of blacks live in these neighborhoods nationwide. Along a similar vein, the “concentration of poverty” metric (the proportion of poor that live in high poverty neighborhoods) tends to suggest this pattern is not just an urban (big city) phenomenon for blacks and that it generally corresponds pretty well to their elevated overall poverty rates (my use of racially disaggregated poverty rates within each group at a county level likely corresponds quite well with this). All groups are appreciably are more likely to live near their own and thus poverty rates have clear predictive power for the amount of “concentration of poverty” you are apt to find in any given area. It’s also worth noting that the hispanic poverty concentration is pretty similar to blacks and yet their homicide rates are much lower (even controlling for poverty rates). Other things being equal (e.g., earnings levels, employment, etc) higher rates of single-motherhood will tend to have a direct mechanistic effect on poverty rates (fewer earners and lower average female earnings) which, itself, will tend to increase the “concentration” metric too. (Which does not mean that single-motherhood is simply measuring poverty, because poverty rates don’t explain differences in single-motherhood that well, especially not between groups…. even though aggregating the data together implies it’s a near-linear inverse relationship, see table below). I have also seen various media reports of analysis that purport very large differences in “neighborhood disadvantage”. This figure implies that there is very little overlap in neighborhood context, which may actually be sort of true, but this methodology obviously leans heavily on single-motherhood rates and racial segregation to find racial differences this vast, i.e. it’s not simply a measure of concentration of poverty. I must confess that I am a little unclear as to how it is that people that presumably believe there no are important cultural differences between groups think that racial segregation per se, after controlling extensively for economic conditions, education rates, and the like, is supposed to have large, quantitively significant, effects on socially important outcomes. If they truly believe that then controlling for the educational, occupational, and income levels of neighborhoods ought to render racial differences insignificant. If these sorts of (statistical) differences don’t exist between racial groups after controlling for socio-economic conditions especially, then why should the racial composition of the neighborhood matter? But if they do matter, as careful analysis of that data clearly indicates, then it makes even less sense to attribute any and all so-called racial segregation to racism and similar irrational behavior (i.e., racial segregation may be unfortunate and consequential, but that doesn’t mean that it’s actually irrational). While I have argued that even controlling for socio-economic status (SES) blacks are more likely to have serious social problems, I wish to make clear, in case I have not already done so, that this is a statistical proposition. I am not arguing that arguing that most black men have committed serious crimes anymore than progressives that argue that SES is an important consideration in crime mean to argue that all poor people (of any race) are criminals. Even controlling for typical measures of SES, we still find that race has quite a bit of predictive value when it comes to crime, school discipline problems, and the like. To this point, I have seen good evidence that black immigrants in the US experience vastly lower rates of incarceration (much closer to the white average). It’s also not likely to be explained well by selection (e.g., cognitive ability, education levels, etc) because we find these differences even controlling for education levels. Inter-racial differences are better explained by family structure than economic conditions. The (intra-racial) black homicide rate, in particular, is better explained by family structure than poverty rates and, especially, other economic measures. There are large differences in family structure between whites and blacks, in particular. It’s probably not a coincidence that other groups fall closely along this regression line when aggregated at national or even state levels. The inter-racial differences in family structure are not well explained by income or poverty measures, i.e., (domestic) blacks of the same income level have much lower levels of traditional family structure. Although there is a significant and growing body of evidence that school discipline, county-wide crime rates, and the like are significantly influenced by genetic risk-factors and although heritable differences between racial groups cannot simply be assumed away, I do not believe that all group differences are necessarily genetic (not entirely at least!). It is possible, perhaps even likely, that heritable differences explain some of these differences in family structure (both within and between groups), but even so that does not mean that spillover effects cannot add up in disastrous ways (concentrating large numbers of poorly supervised, poorly socialized young men, especially low social status young men, may produce effects that we might not find if they were more dispersed or better integrated into society). Regardless, if community context does have non-trivial effects on outcomes of this sort, then advocates for “de-segregation” work at cross-purposes when they argue: that racial differences don’t exist; that they can be explained almost entirely by economic conditions; or that anything that remains after such controls are put in place must be explained by racism, bias…. and so on and so forth. It is abundantly clear that there actually are large racial differences even within schools and classrooms with respect to discipline problems, academic outcomes, and the like today. These differences exist even with standard controls for SES (though, incidentally, many studies use SES controls when measuring the effects of integration, but the sort of integration people think usually involves low-SES blacks). If people truly want more and better integration then denying these facts and implicitly charging schools, teachers, and the like with racism for disparate outcomes is ultimately counter-productive. If blacks are statistically more likely to seriously misbehave due to unmeasured differences like family structure (or, alternatively, unmeasured “social capital”) raising holy hell every time significant disparities are found and insisting that “racism” is the cause is only apt to increase resistance to further integrating neighborhoods and schools because broadly middle class whites, asians, and most other parents (blacks included) really don’t want to their children to be in school with unruly or even violent children. They are likely to remove their children from said environment if it is in their power. Firm discipline may, arguably, be the price of admission if more integration of neighborhoods and schools is desired on both the economic and racial dimension. Statistical racial differences are all but inevitable in those circumstances (i.e., especially integrating low-SES blacks in with middle class whites, asians, etc). Different discipline procedures might help to reduce the absolute rates of suspension and expulsion (hopefully without worse unintended consequences! ), but racial differences are still bound to be non-trivial for the foreseeable future and it’s hard to even grapple with these things productively as a society when we deny basic objective facts and suppress vocal dissent. The ability to suppress open dissent should not be confused with the ability to suppress the consequences of dissent. It especially should not be confused with the reality of the issue itself. Great analysis! Complementary to your work Sethi and O’Flaherty use a game theoretic analysis to show that differences in violence can in part be associated with preemptive motives for violence. Do you think you could look at the longitudinal data through the lens of lead versus changes in rates of black single-parenthood as competing hypotheses? The single-parenthood rates are a result of policies that reward women and lower income groups for divorce and single-parenthood. Given blacks had a disproportionately low income at the time policies of no-fault divorce, child-tied welfare benefits, and child-tied spousal support were put into place, it makes sense these policies disproportionately impacted the black community, thus causing all the social malefactors related to it. Yet at that time, 89% of black people were slaves, despite being only 12.6% of the U.S. population. I’d be interested to see the author examine this disparity and provide some hypotheses to account for it. Your 2nd link implies blacks were 14.1% of the population at the time (not 12.6%) and this is generally consistent with my understanding of the data too. I don’t see any disparity to resolve…. also not sure how this relates to my research. Oh I agree immigrants tend not to be fully representative of the countries they come from. Selection for various characteristics (genetic, cultural, socioeconomic, etc) is always a very real possibility and the non-genetic traits don’t necessarily persist more than a generation or two…. Single motherhood is in my view a mediocre determinate of crime as well. It increases rates, but like income has serious drawbacks. The counterfactual would be wealthy nations with high rates of out of wedlock births. Chile has the highest rate in the world with a murder rate of 3.1 for 2012. Iceland has an out of wedlock birthrate of just under 70%. Its one of the only European country that comes close to the African American rate (~72%). Yet they, like so many other European nations including the poorer one has a very low homicide rate. Liberal explanations about poverty and racism being the root of black criminality and social underachievement have elements of truth but are incomplete. 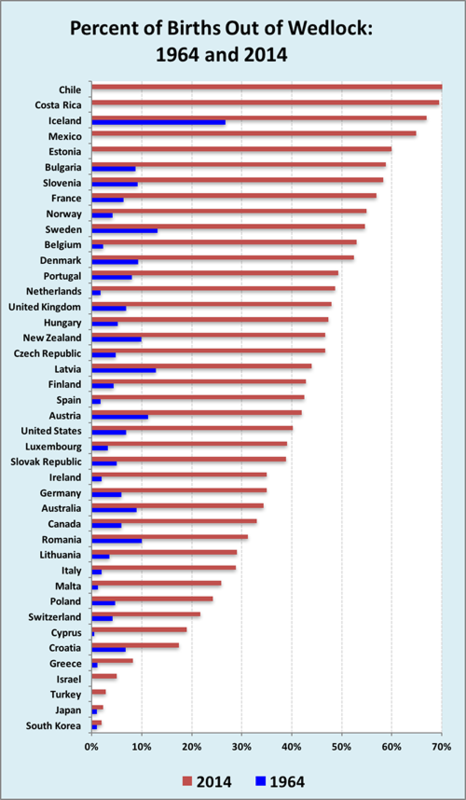 By any measure including GDP per capita, hourly earnings+benefits, median household income, and median individual income almost every European nation is poorer than America. They do not have the murder or sexual assault crime states the USA does. Similarly, so are conservative explanations about big government and the breakdown of the family. The EU has a far more developed and generous welfare state. They have similar or higher rates of divorce, similar or higher rates of single motherhood, and much higher rates of atheism and agnosticism. Drug use is less taboo and more common in some places that have experimented with decriminalization. Yet, despite the breakdown of the family and its replacement with “big daddy government” the Europeans have been able to largely adapt without the violent consequences. Homicide by Nation. International comparisons can get really messy, but looking at OECD nations helps in this discussion. I’m not very into statistics. I didn’t understand: so, how much of the white-black homicide rate gap is explained by single-motherhood? When aggregated at a (very high) group level, family structure appears to (statistically) “explain” close to 100% of the differences in homicide rates between groups (r-squared very close to one). It also appears to explain a tremendous amount within and between groups at slightly lower levels of aggregation (groups by state) — the logarithmic plot+regression implies that if black communities had family structure rates comparable to that of white or asian communities (even better), their homicide rates would be in the same ballpark if the trend continues [a pattern which surely cannot be claimed for measures of income, wealth, etc!] Of course, there is virtually no overlap at reasonably high levels of aggregation (state, city, or even county) so we can’t actually observe it (white family structure rates in the worst states are still better than black family structure rates in the best states for blacks). 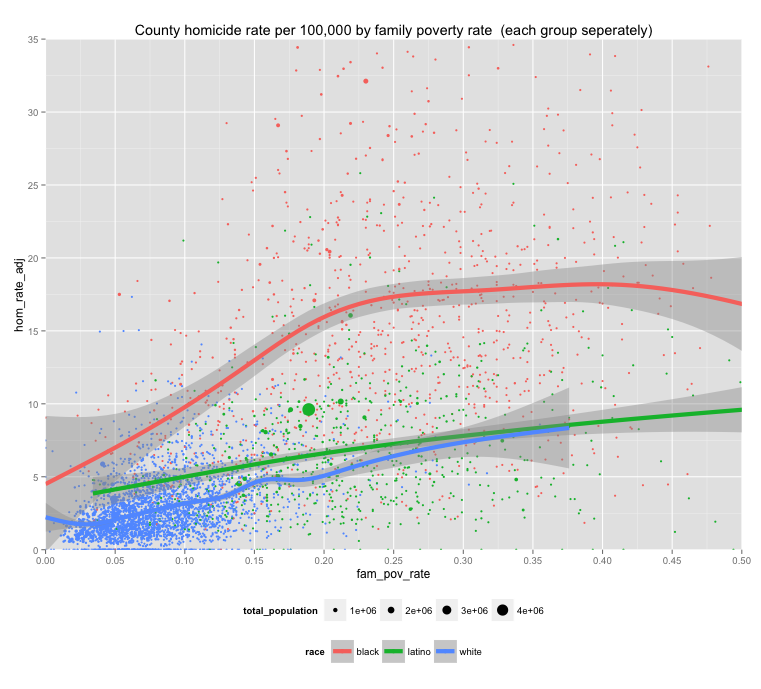 Even at the county level, there is next to no black-white overlap with respect to family structure, certainly not enough to reliably estimate homicide rates for both IMO (especially in more of a real world understanding of the data where people don’t necessarily live and interact neatly within their county boundaries, not to mention issues of measurement error, etc). That said, while I personally believe family structure is likely to be at least partially causal here, I’m not necessarily arguing one needs to accept this is purely or even partially causal either. My point, RE: family structure, is that it fits the data much better than income and other available economic indicators (e.g., poverty, wealth, housing values, etc) and that it should probably be taken a lot more seriously as an area of inquiry (especially by progressively-minded folks).